Helicopter Technik München, HTM Skytrac D-HARB. "The twin rotor HTM Skytrac was a little work helicopter fitted with a flat six. 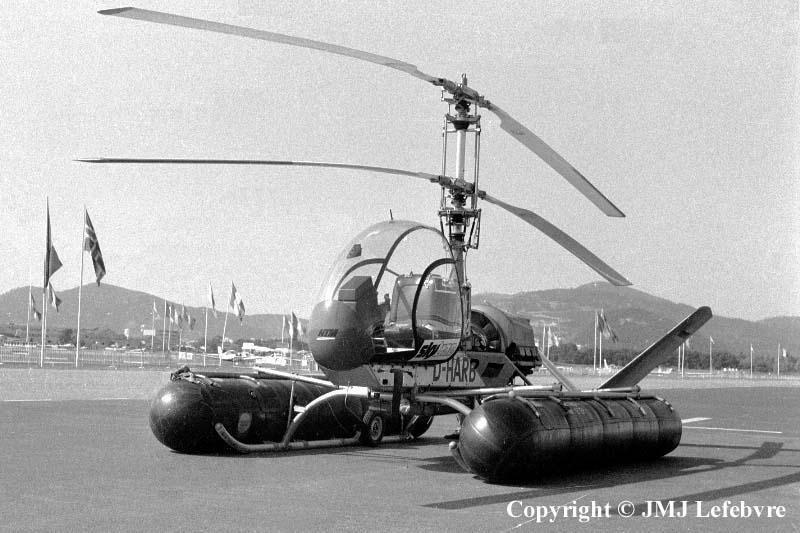 It found its origins in the early sixties from one of five Alfred Vogt's design at the Helicopter Technik Wagner which later became Helicopter Technik München ( HTM ). From first project with a 95 rotary engine and a skid undercarriage with a pod-shaped body derived the Skytrac torqueless having a chassis frame carrying engine and a twin contra-rotative rotor system to which a variety of cabins and equipment can be fulfilled for various roles. First proto was single seat tailess Skytrac 1 D-HAJE, second was the three-seater Skytrac 3 D-HAJI, all two appearing at the 1966 Hanover Air Show. They were powered by Franklin 95 hp piston-engines. This machine D-HARB, it appeared on the German Register as Skytrac 1 C/n 12 in 1972 and disappeared in 1976, surely consistute a quite more sophisticated version having now a strong beam supporting a completely redesigned all-vision single-seat cabin with rear enclosed engine, now a six cylinders Lycoming 0-540 of 305 hp and a low rotorless tailboom with a V tail. In its agricultural role, it seems that the contrarotative rotor gave a neatly better spraying of chemicals. It embodies two tanks of a total chemicals capacity of 480 liters installed symetric outside the skid undercarriage and a 12 meter wide spray ramp (same diameter as yhe twin-rotor) with 26 holes receiving 24 different types of sprayers device according the nature of chemicals etc. Flow was from 3 to 210 liters by minute giving an efficiency of 6 to 260 liters by hectare. Price of the helo was then 213,000 Deutsche Mark and add some 3000 to 4000 marks for spray or dispersion equipment and naturally 1800 extra marks for the two chemical tanks. Do the addition!!! For next or third part of this series I try to scan the plunging front view of Skytrac with its agricultural panoply and two or three docs found on the web.